My whole life I have been told by (American) football players, fans, and random macho men that soccer is for sissies, fairies, and fags. They obviously have never taken the time to watch a single match of proper football and see what a contact sport it is. I would like to see someone say that to Sol Campbell. 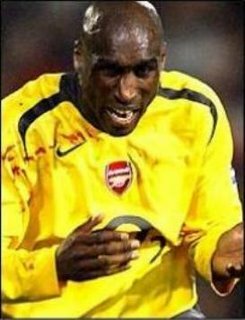 Sol is a colossus in a sport where you run over 5 miles in each & every match. He goes 6'2", 215, which usually makes him the biggest man in any match he plays in (not always tallest, but biggest for sure). 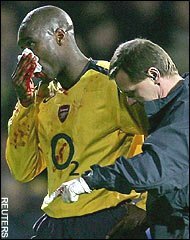 Last night against Portsmouth he got a nasty bloody gash above his eye while challenging for a header. He was bleeding pretty bad, but the trainer patched him up very well and he continued. 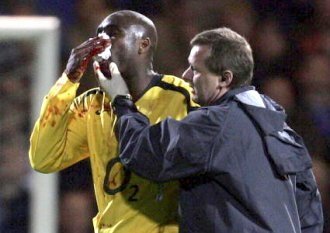 Instead of leaving the match he played on with a nasty gash that started trickling blood down his face and onto his jersey as the match went on. Then in the last minutes of the 2nd half he contested another header and another random elbow to his face broke his nose and turned his face into a waterfall of blood. This was the result of simply playing the game and contesting 50/50 headers, not the result of some horror challenge where a dude rakes his studs on another man's leg (sometimes these are intentional, sometimes not). No, they don't line up and run into each other as fast as they can like in Football Americano, but real football damn sure is a physical game. Soccer (or Futbol) is on here in Dublin 24/7 and I can't believe how serious everyone is about it. I've found myself watching more soccer than I ever thought and agree that most Americans wouldn't understand the amount of contact that takes place. It actually makes the game more interesting to watch and if the US had premiership calibre teams I believe more folks would tune in. Soccer in America is a sissy sport. I mean really, most people in America see the local high school soccer team or premier league team and its full of sissies and wannabe jocks. If youth soccer teams and the amateur soccer program in America were developed more and better athletes populated the playing field, the "weak" image would be lost. BTW, I'm glad to see a UGA blogger with Futbol interests. Look forward to seeing your take on the World Cup. Thanks Dawg05. I will be all over the WC. LD over at Gunslingers posts on footy from time to time, so I am sure he will be on it as well. And Swindle from EDSBS says he is going to be all over too.